DESCRIPTION This four bedroom detached house is situated in one of the much sought after areas of Upper Prestatyn and stands among similar high quality homes of character and individuality. It is conveniently placed to Prestatyn’s main town centre which stands within a mile and boasts a full array of shops and services. Educational and recreational facilities are well provided for with Prestatyn’s High School and Sports Centre being a short walk away. Traditionally built in the 1920s the property has been the recipient of improvement works throughout and has been extended providing larger than average accommodation. It benefits by way of double glazing and gas fired heating and stands in mature gardens with a garage and ample off street parking. A master bedroom with ensuite shower, the property can be described as ‘ready to walk into’ and is surprisingly spacious and tastefully decorated. RECEPTION HALL: With oak flooring throughout and radiator. GROUND FLOOR CLOAKS: 6′ 10" x 2′ 9" (2.09m x 0.84m) With a low flush w.c., washbasin and radiator. SPACIOUS LOUNGE: 22′ 0" x 13′ 1" (6.71m x 4.01m) With a jet master open fire in a classic style with a limestone surround and over mantle, and a raised slate hearth, radiator and power points. There is an open archway leading to a large bay window overlooking the rear garden with patio doors leading into the garden area. DINING ROOM: 15′ 4" x 13′ 0" (4.68m x 3.98m) With a coal effect fitted gas fire in a feature fire place with raised hearth and surround, radiators, power points throughout and bay window overlooking the front of the property. 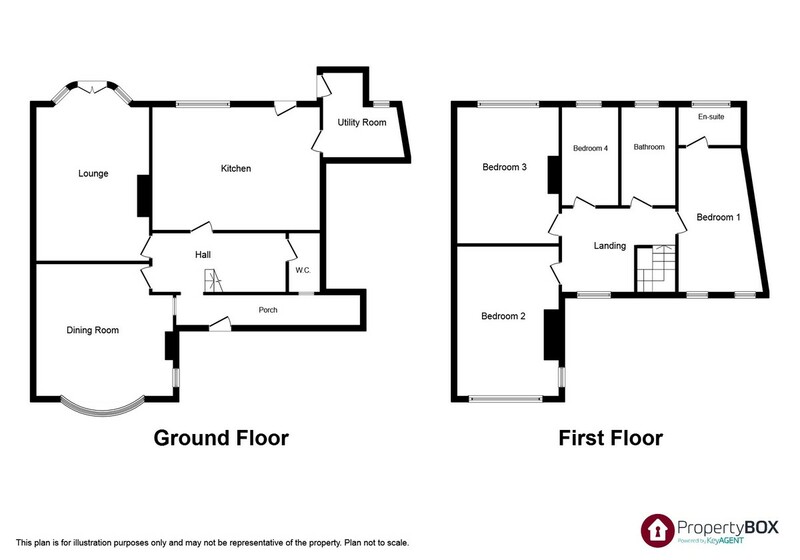 KITCHEN: 13′ 8" x 15′ 2" (4.17m x 4.64m) With breakfast area and French doors leading onto the patio and rear garden. Having a wealth of light oak units with granite worktop surfaces and matching fitted wall cupboards. There is a six burner cooking range with built in oven and vented extractor hood above, part-tiled splash backs, an integrated eye level ‘Neff’ oven and grill, integrated refrigerator with matching front decor panel, integrated dishwasher, built-in wine rack, ceramic flooring, radiators and power points. UTILITY ROOM: 8′ 4" x 10′ 0" (2.55m x 3.06m) With a stainless steel top sink unit, ceramic flooring, a wall mounted combination Worcester gas fired central heating boiler supplying the radiators domestic hot water and plumping for automatic washing machine. Personnel door giving access to the Garage . LANDING With radiator, power points and window overlooking the front. MASTER BEDROOM: 12′ 11" x 11′ 2" (3.96m x 3.41m) With twin window aspect over the front of the property. Double panelled radiator and power points. BEDROOM 2: 14′ 4" x 13′ 1" (4.39m x 4m) With radiator, power points and window overlooking the front of the property with distant sea views. BEDROOM 3: 14′ 4" x 13′ 1" (4.39m x 4m) With radiator, power points and window overlooking the rear of the property. ENSUITE SHOWEROOM: 8′ 1" x 4′ 5" (2.48m x 1.36m) Having a three piece suite with double shower, wash basin vanity unit, close couple low flush w.c., heated towel rail , illuminated mirrors and inset spotlighting. BEDROOM 4: 10′ 4" x 8′ 5" (3.15m x 2.57m) (Currently used as a study) with radiator, power points and window to the rear. FAMILY BATHROOM: 10′ 3" x 6′ 3" (3.13m x 1.92m) Having a three piece suite in white with close coupled low flush w.c., pencil wash basin, bath with shower above, heated towel rail, inset spotlighting, ceramic flooring and tiled walls. OUTSIDE The gardens to the front are matured, bounded by limestone walls and well stocked borders with maturing trees. Wrought iron double gates access the driveway providing ample off street parking and lead to the GARAGE with up and over door, power, light and door leading to the Utility Room . The gardens to the rear are lawned for ease and maintenance, with maturing trees including a well established bay tree and paved patio area. SERVICES: Mains electric, gas, water and drainage are believed available or connected to the property. All services and appliances are not tested by the Selling Agent. DIRECTIONS: Proceed left from the office along Meliden Road for about half a mile, bear left onto The Avenue, Woodland Park, immediately left into Coed Mor Drive and the property can be seen on the right hand side.